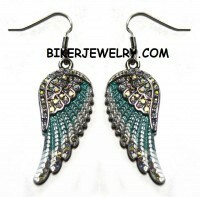 Turquoise color with Bling Crystals makes these large Ladies Angel Wing Earrring one hot piece. Dangleing on a Stainless Steel French wire. Made from clean 316L Stainless Steel. Don't forget the matching Necklace (SSP 29) or (SSP 41) for that complete set.